146 BC - 17 Jan 395 AD Part of the Roman Empire. 17 Jan 395 Part of the Eastern (Byzantine) Roman Empire. 883 - Feb 1018 Part of Bulgaria. Feb 1018 - 1203 Part of the Byzantine Empire. 1203 - 1246 Part of Bulgaria. 1246 - 1282 Part of the Byzantine Empire. 1282 - 20 Jun 1459 Part of Serbia. 9 Oct 1912 Occupied by Serbia (New Style date 22 Oct 1912). 7 Sep 1913 Formally annexed to Serbia. 23 Nov 1915 - 10 Oct 1918 Occupied by Austria-Hungary and Bulgaria. (Committee for the National Defense of Kosovo). 10 Oct 1918 - 29 Nov 1918 Occupied by French and Italian forces. 29 Oct 1918 Serbian rule restored. (Old Style date 18 Nov 1912). 12 Apr 1941 - Apr 1941 Occupied by Germany. Apr 1941 - 10 Sep 1943 Occupied by Italy. Kosovo part of German occupied Serbia). 10 Sep 1943 - 19 Nov 1944 Occupied by Germany. 19 Nov 1944 Re-incorporated into Yugoslavia. 23 Mar 1989 Autonomy reduced, resulting in widespread unrest. within Yugoslavia which is not recognized. 5 Jul 1990 Parliament and government suspended by Serbia. 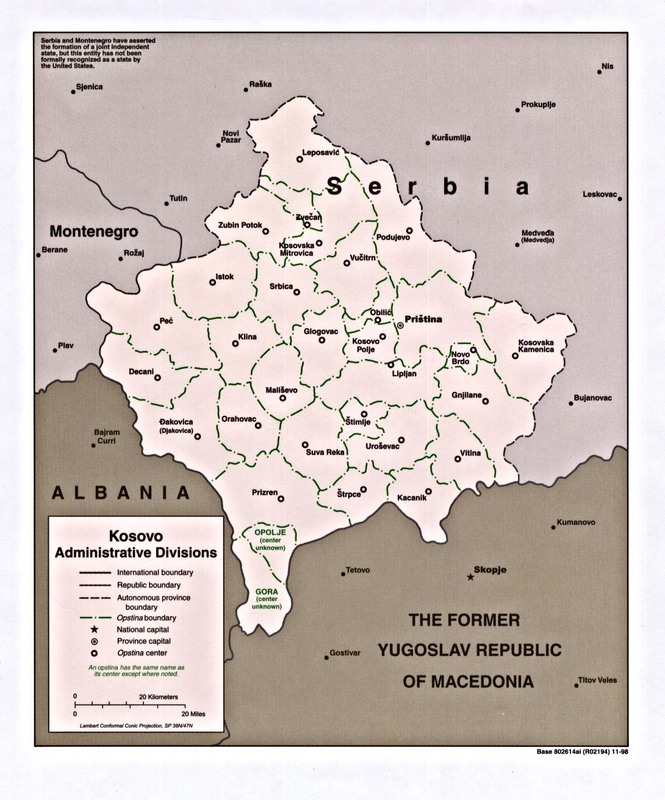 Feb 1998 - 11 Jun 1999 Kosovo war. 10 Jun 1999 Serbian forces withdrawn. recognized by Serbia or Russia). 22 Sep 1991 Sovereignty declared. 19 Oct 1991 Kosovo declares independence from Yugoslavia (not recognized). 12 Jun 1999 Kosovo under foreign occupation (UN administration; see above). 31 Jan 2000 International administration recognized. administration and Republic of Kosovo government. 19 Dec 1999 Serb National Council at Mitrovica established as a rival body. institutions (referendum not recognized by Kosovo or Serbia). Territorial Disputes: Serbia along with Russia and other states protest the U.S. and 101 other nations' recognition of Kosovo's declaration of its status as a sovereign and independent state in Feb 2008; ethnic Serbian municipalities along Kosovo's northern border challenge final status of Kosovo-Serbia boundary; several thousand NATO-led Kosovo Force peacekeepers under United Nations Interim Administration Mission in Kosovo authority continue to keep the peace within Kosovo between the ethnic Albanian majority and the Serb minority in Kosovo; Kosovo and Macedonia completed demarcation of their boundary in Sep 2008. Metohija established (in rebellion, against occupation). 17 Feb 2008 Independence declared (not recognized by Serbia). 12 Dec 1953 - 5 May 1956 Đorđije (Djordjije) Pajković (s.a.) SKK? 1992 Novica Sojević (acting) (b. 1940) SPS?